These days, shooters have great latitude in choosing a holster. Besides the excellent production holsters that are available at your local gun store, there are many custom holster makers who will produce most any holster that you might need. I often recommend Rob Leahy and Bob Mernickle to build custom holsters, as both do an excellent job, but have different styles. 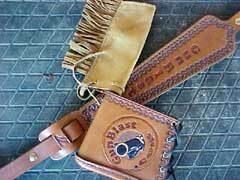 Recently, I was made aware of a leather craftsman who specializes in leather products for the hunter and outdoorsman. 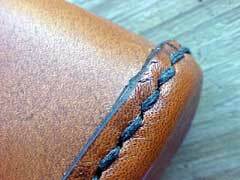 Chance "Lever" Shelton is the artisan behind Levergun Leather Works. He runs a one-man operation that offers a wide variety of leather products, in addition to holsters. 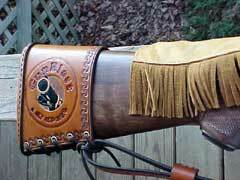 One can spend a great deal of time perusing his website looking at the products that he offers. 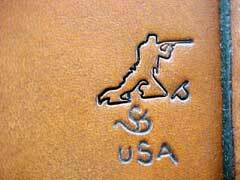 In addition to the aforementioned holsters, Lever produces scabbards, sight covers, rifle and bow covers, slings, knife sheaths, guitar straps, cartridge belts, and just about anything leather that you can imagine. 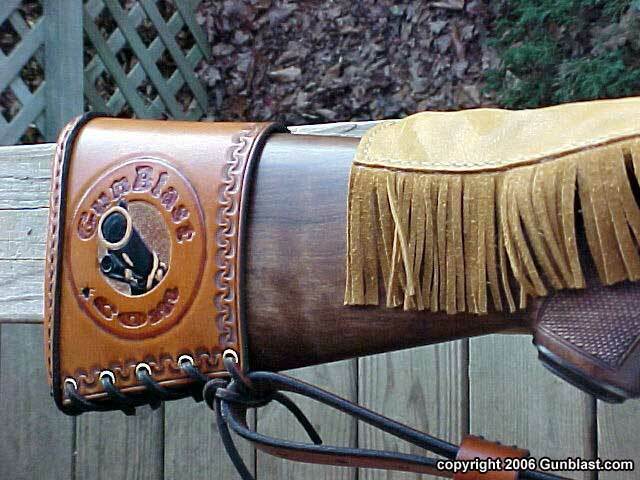 If you want it made out of leather, chances are he will make it. 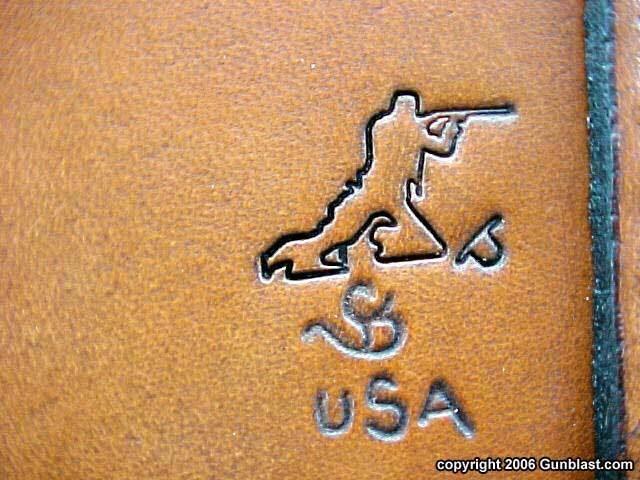 While this great variety of leather products will prove very useful to many, my main interest is guns, and his gun leather is what interests me. 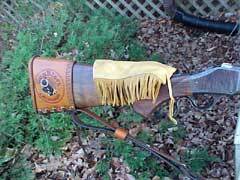 A couple of months ago, I acquired a buffalo gun. 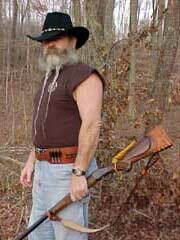 This is not necessarily a rifle that I purchased to use on live buffalo, but I suspect that it will receive such use also. 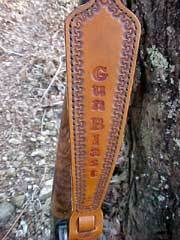 Instead, this rifle was selected for use on steel buffalo; not just any steel buffalo, but one particular steel buffalo. Allow me to back up a bit. Last June while I was at the annual Shootists Holiday, which is an invitation-only event held at the NRA Whittington Center in New Mexico, I got a chance to shoot at a steel life-sized buffalo at a distance of 1125 yards. 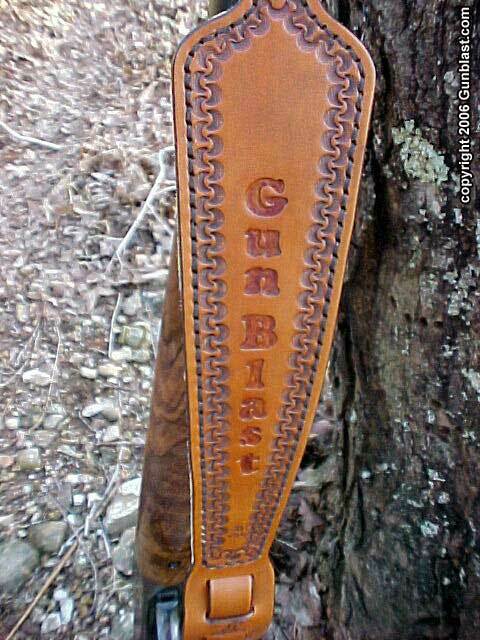 I only fired two shots at the metallic beast, hitting with the first and missing with the second, but I was hooked. 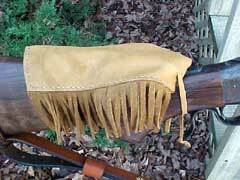 I was using a borrowed Sharps .45/70 single shot rifle, and I made up my mind to have my own "buffler gun" before the 2006 Shootists Holiday. 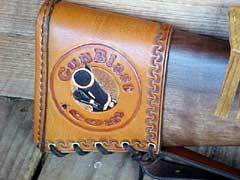 Back to the acquisition of the buffalo gun. 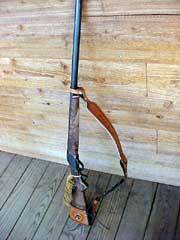 I was at a gun show in Smyrna, Tennessee, when I spied upon a table a Browning 1885 High Wall BPCR single-shot rifle. 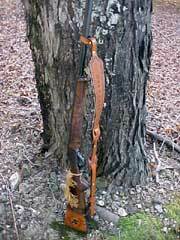 These rifles were made expressly for the purpose of long-range steel silhouette shooting. They have long-range tang sights, beautiful wood, and wonderful Badger half round / hanf octagon barrels. 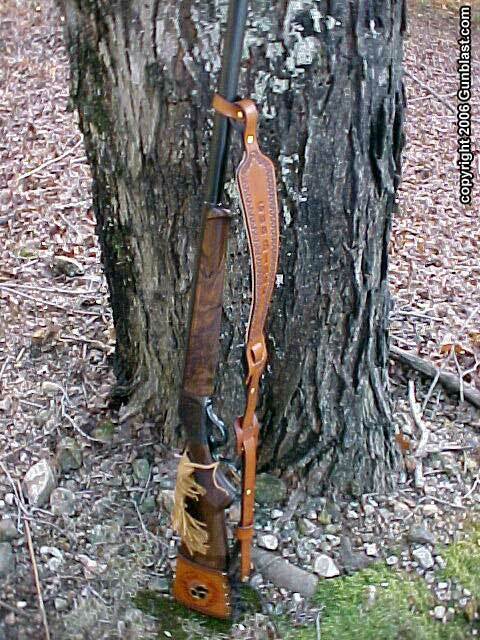 The one that I saw was chambered for the .40-65 Winchester cartridge. 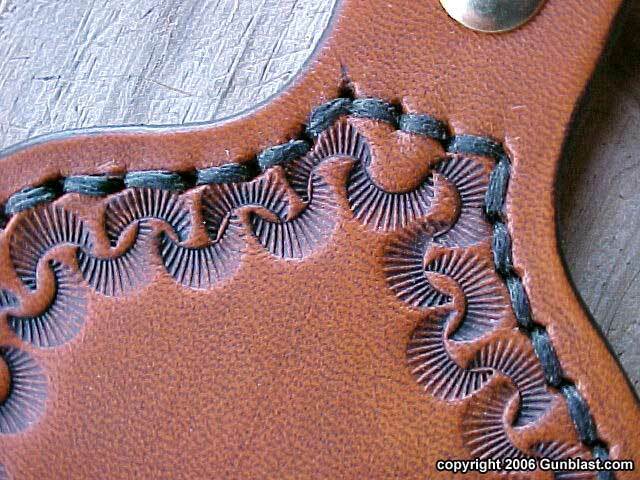 A few minutes and a bit of haggling later, I was lighter in the money clip, but had my buffler gun. After laying in a supply of cartridge cases and bullets, and breaking in that new Badger barrel, there was still a couple of things needed for the buffler rifle. I was using a cotton kids-sized sock to protect the rear sight from damaging the stock, so it definitely needed a more appropriate sight cover. It also needed a sling; not for when shooting the steel, but for field use. 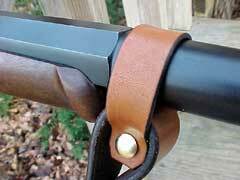 The BPCR does not come with sling swivel studs, and if it did, they would certainly look out of place on this rifle. However, it still needed a sling and a sight cover. 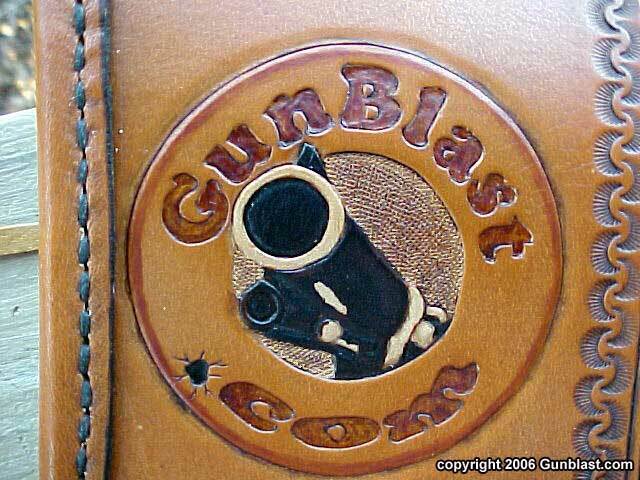 This is where Levergun Leather Works comes in. 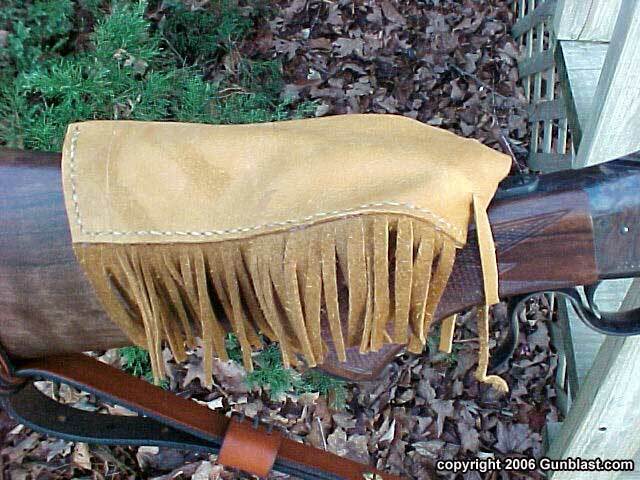 Lever makes some beautiful buttstock covers that allow the easy attachment of a sling without altering the rifle, and also produces some very functional and good-looking slings. After exchanging a couple of emails, he knew just what I needed. The results are shown in the photos much better than I can describe them. 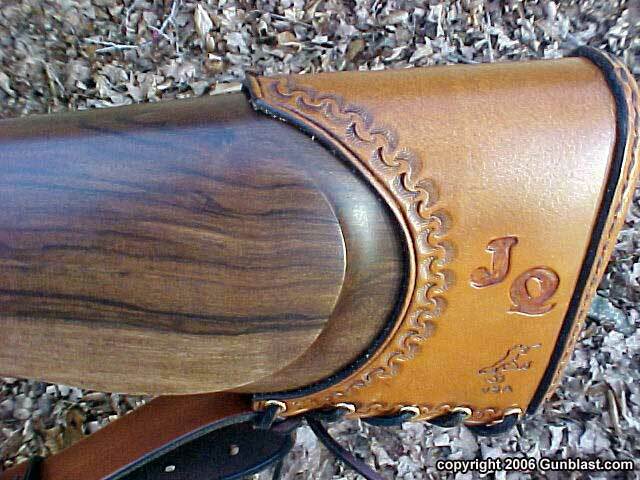 I will say that his work is first class, and the quality of the buttstock cover, sling, and sight cover greatly exceeded my expectations. The fit was perfect. 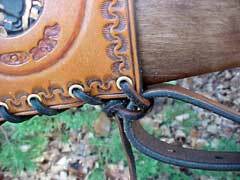 This is a great way to install a sling on a single shot or lever action rifle, and would also work well on a shotgun used for turkey hunting. 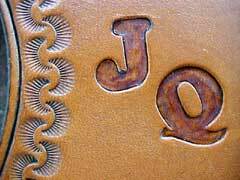 Lever is an artist who uses leather as his medium. 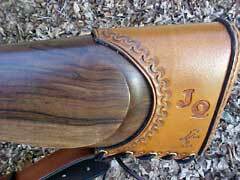 If you have an idea for a leather accessory for one of your guns, he can probably produce it. His products are beautiful and functional, and I highly recommend them. Look at the extensive line of Levergun Leather Works products online at: www.levergunleather.com. 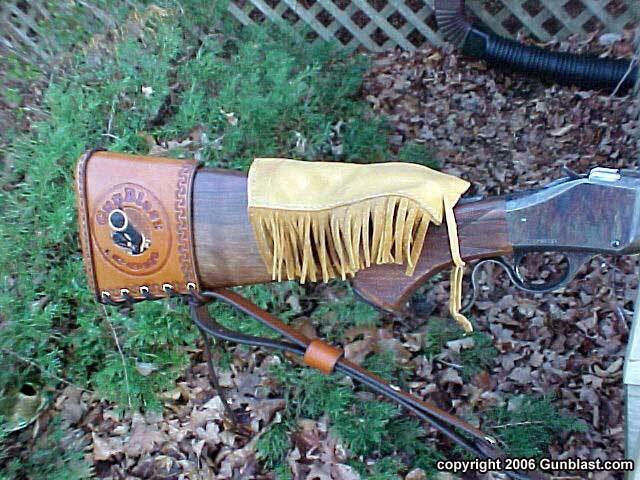 Levergun Leather Works custom sling and sight cover for Jeff's .40-65 Browning High Wall "buffler gun". 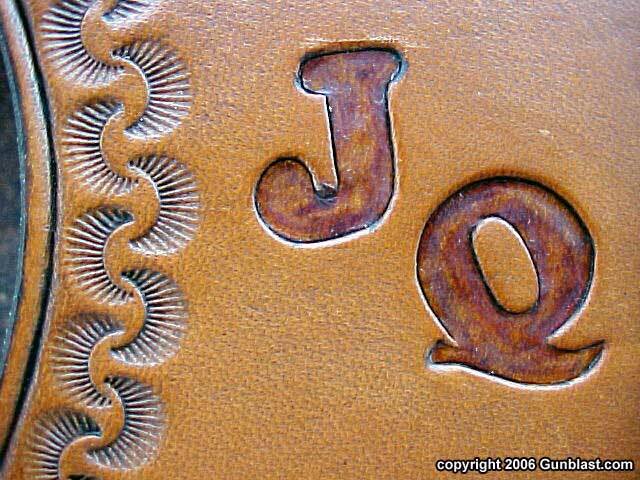 Levergun Leather Works' brand stamping is truly a hallmark of quality.